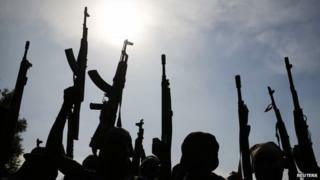 More than 9,000 child soldiers have been fighting in South Sudan's brutal civil war, UN human rights chief Navi Pillay has said. Both the army and rebel forces had recruited the children, she said. Ms Pillay said South Sudan faced the threat of a famine, but there was an "apparent lack of concern" on the part of its leaders. She was speaking at the end of a visit to South Sudan, where the conflict has displaced about a million people. Fighting broke out in December between forces loyal to President Salva Kiir and his sacked deputy, Riek Machar. Mr Kiir accused Mr Machar of plotting a coup. He denied the charges, but then mobilised a rebel force to fight the government. Media captionThe UN High Commissioner for Human Rights has warned of the possibility of revenge killings in South Sudan. The two sides negotiated a truce in January and have resumed talks in Ethiopia, but fighting has continued. Ms Pillay said that apart from recruiting child soldiers, both government and rebel forces have carried out "indiscriminate attacks" which killed civilians, including children. She met both Mr Kiir and Mr Machar during her visit, and is now due to fly to Ethiopia. "I was appalled by the apparent lack of concern about the risk of famine displayed by both leaders," she said, AFP news agency reports. "The prospect of widespread hunger and malnutrition being inflicted on hundreds of thousands of their people, because of their personal failure to resolve their differences peacefully, did not appear to concern them very much." Ms Pillay's visit came amid growing foreign intervention in efforts to end the conflict in South Sudan, the world's newest state. US Secretary of State John Kerry is due in Ethiopia later on Wednesday, to put pressure on the two sides to negotiate a peace deal. On Friday, South Sudan's government released four politicians accused of plotting a coup, meeting a key rebel demand. The UN Security Council has threatened sanctions against those responsible for the continuing violence. It has condemned the the mass killings of hundreds of civilians in the town of Bentiu, capital of the oil-rich Unity State, earlier this month. Both sides have been implicated in atrocities and war crimes, and fighting has intensified with the rebels saying they are closing in on northern oil fields and several key towns. Image caption Fighting erupted in the South Sudan capital, Juba, in mid-December. It followed a political power struggle between President Salva Kiir and his ex-deputy Riek Machar. The squabble has taken on an ethnic dimension as politicians' political bases are often ethnic. Image caption Sudan's arid north is mainly home to Arabic-speaking Muslims. But in South Sudan there is no dominant culture. The Dinkas and the Nuers are the largest of more than 200 ethnic groups, each with its own languages and traditional beliefs, alongside Christianity and Islam. Image caption Both Sudan and the South are reliant on oil revenue, which accounts for 98% of South Sudan's budget. They have fiercely disagreed over how to divide the oil wealth of the former united state - at one time production was shutdown for more than a year. Some 75% of the oil lies in the South but all the pipelines run north. Image caption The two Sudans are very different geographically. The great divide is visible even from space, as this Nasa satellite image shows. The northern states are a blanket of desert, broken only by the fertile Nile corridor. South Sudan is covered by green swathes of grassland, swamps and tropical forest. Image caption After gaining independence in 2011, South Sudan is the world's newest country - and one of its poorest. Figures from 2010 show some 69% of households now have access to clean water - up from 48% in 2006. However, just 2% of households have water on the premises. Image caption Just 29% of children attend primary school in South Sudan - however, this is also an improvement on the 16% recorded in 2006. About 32% of primary-age boys attend, while just 25% of girls do. Overall, 64% of children who begin primary school reach the last grade. Image caption Almost 28% of children under the age of five in South Sudan are moderately or severely underweight. This compares with the 33% recorded in 2006. Unity state has the highest proportion of children suffering malnourishment (46%), while Central Equatoria has the lowest (17%).